Match-winner Steven Gerrard left Craven Cottage with the comforting feeling that Liverpool had passed a significant test, but equally aware of the necessity to learn from the mistakes committed against Fulham. As Wednesday's encounter with the West London outfit drifted into added time with the score locked at 2-2, the lifeline of a penalty materialised - an opportunity grasped by the Reds' captain as he drilled an inch-perfect finish into the corner. The conversion sealed victory for Brendan Rodgers' side and concluded a fixture in which the visitors had trailed on two separate occasions, with the hosts profiting from defensive lapses in each situation. Upon the final whistle then, Gerrard's elation with the full-time result and its ramifications for the Barclays Premier League table was matched by a determination to use the trip south as an education for what remains of the 2013-14 season. 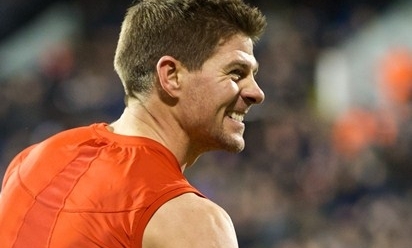 The skipper told Liverpoolfc.com: "It's a great win for the lads. I got the final penalty, which is an important spot-kick, but it was about the character and determination we showed today. "I don't think we defended well enough but we showed plenty of guts and we never gave up. If you do that, more often than not you get the breaks - and we got one in the end. It was a great win for us. "Against Arsenal, we showed how much class we've got. We showed we've got talent all over the pitch; at home, with the atmosphere behind us, you don't have to motivate yourself - you just go out and perform, and more often than not you play well. "But coming away on a Wednesday night, windy, on a difficult pitch, away to Fulham is a big test for the team. We've passed it but we still have to learn from our mistakes and defend better on the road if we're to finish in the top four places. "We're in the mix. It's still early days, there's a lot of football to be played and we're not going to get carried away. But we are in good form. We feel as if we're dark horses. With eight minutes remaining of a frenzied game last night, Rodgers introduced Academy midfielder Joao Carlos Teixeira in place of Raheem Sterling - a senior debut for the talented Portuguese. His appearance followed a recent promotion to training with the first team at Melwood; Gerrard, however, has been aware of the 21-year-old's potential for far longer than that. Quizzed on his analysis of Teixeira's maiden contributions for the club, the No.8 reflected: "It has only been a matter of time. "I watched this kid a couple of years ago playing for Sporting Lisbon against Liverpool at Anfield in a youth game; I could see straight away he was the best player on the pitch. "Credit to him, he has kept working hard. He has been invited to train with the first team. He is competing, he is trying to improve and learn. He listens - I've just been speaking to him in the dressing room and you can see he wants to learn and listen. "He has got respect for the other players in the dressing room. This is the start for him now; I've just told him that he needs to push on, keep learning and building on what he has just achieved. He deserved his debut and he made a special tackle which helped us get over the line." Having further cemented their position within the Premier League top four by beating Fulham, the Reds will now adjust focus for the resumption of the FA Cup and a journey to Arsenal this Sunday. The fifth-round tie will arrive a mere eight days after Rodgers masterminded a 5-1 thrashing of the Gunners in the top flight - but Gerrard insists that display holds no meaning ahead of the return. "Top sides, when they get beat 5-1, they are hurt," he said of Arsenal. "They have just battled to a 0-0 draw against Manchester United so they have showed they have defended quite well in the game. "We're expecting a tight game at the Emirates and I think the 5-1 game will have no bearing on this game coming. We're expecting a really tough game. "It's a break from the league and we'll go there and give it everything we've got because we want a good cup run."